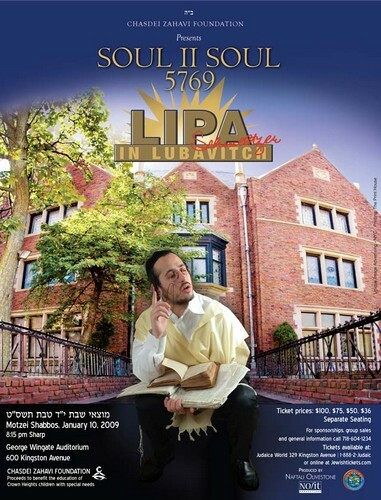 Chasdei Zahavi Foundation presents SOUL II SOUL 5769 LIPA in LUBAVITCH, featuring Shraga Gold and the Shira Choir. Motzei Shabbos January 10th, 2009. 8pm Sharp at the George Wingate Auditorium – 600 Kingston Ave. Ticket Prices; $100, $75, $50, $36. SEPARATE SEATING. For sponsorships, group sales and more information please call 718-604-1234. Tickets available at Judaica World-320 Kingston Ave. or1-888-2-Judaic or online @ JewishTickets.com. Produced by Naftali Olivestone a NO/IT Production.